Going West in the 1800's - From the cowboys to the homesteaders, miners to the military, one industry bound the entire nation together… Transportation. Utilizing scarce imagery from the 1860's through the early 1900's, Wheels That Won The West® publishing has created another exclusive copyrighted print highlighting America's early western vehicle industry. Details of this second-in-a-series print include a large "call-out" section of historically accurate western vehicle terminology. Also included are the unique design features and innovative equipment used to create the rugged wheels of the old west. Specifics include an encyclopedic-type look at seat risers, tongue styles, bed/box designs, bolster spring info, brake lever types, gear parts, setting of wheels, track sizes, and more. Offering another rare glimpse into the Wheels That Won The West® archives, much of the information on this Limited Edition print is not available from any other modern publishing source. 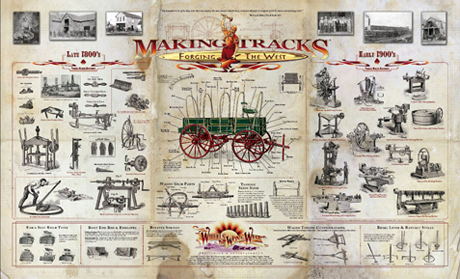 Printed on acid-free, heavy 100lb cover stock with special UV inhibiting inks, "Making Tracks" captures an extraordinary glimpse of the all-but-forgotten work of thousands of early vehicle makers. 23" x 38" overall size. Makes a great gift! Ships in an oversized, heavy-duty 5" tube with protective cover sheet for the print. $88 plus U.S. s/h -- Available exclusively from a select group of retailers.